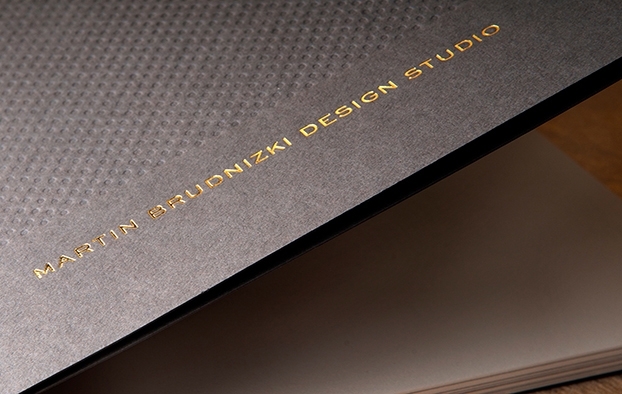 Foiling and Embossing are some of our most popular finishing services. Foiling and Embossing are finishing techniques that will make your prints look fantastic; these finishes give your print a quality unrivalled by digital or litho printing methods, and really make them stand out. 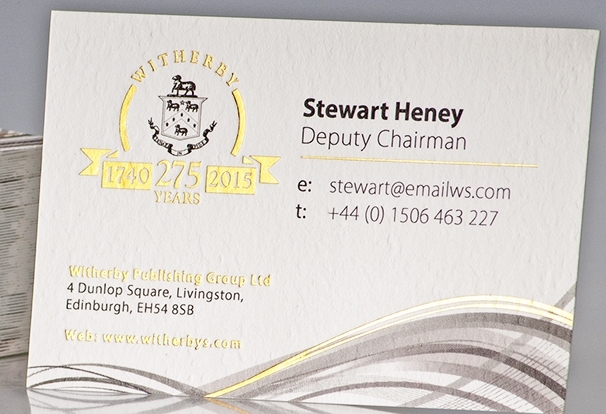 We are able to use many different foils, metallic and pigment colours, as well as holographic and security foils. Embossing and Debossing work well on their own, but can be combined with foils for a truly impactful finish on business cards, invites, and brochures covers. Making your prints look special will show your customers that your business is special. Showing quality in the materials that you use will allow you to gain quality customers and collaborators. We offer a flexible service and are happy to take up unorthodox design jobs should you require it. Foiling is the process of adhering a metallic looking film to the surface of a substrate (a paper, board, plastic sheet etc). What colours are available for foil blocking? A wide range of colours are available, the most popular tend to be golds, silvers, clear and white. There is a more limited colour pallet than the pantone swatches that printers and designers are used to, however. You’re unlikely to find a massive range of different hues of orange, for example, like you would from pantone swatches. What variations of foil are available, e.g. are matt and gloss finishes available? Most foils are glossy and metallic, although there are some satin and matt versions along with pearls and brushed effects. There are also a standard range of patterned holographic foils available. What materials can foiling be printed on? In general substrates that we would foil onto include papers, boards, plastics & laminated sheets. We have foiled on to fabric and leather book covers but this isn’t a routine procedure for us. Still, if that’s what you’re after, get in touch, we can be flexible! What type of paper works best with foiling? Uncoated papers work the best as these give the greatest contrast between gloss foils and the matt of the substrate. It tends to be favoured for most jobs we foil, but we’re happy to try out foiling on other paper if that’s what your design requires. How much of the artwork is foiled? Due to the cost of the tools and the way the foil is used in designs it tends to be smaller areas of detail or logos that are foiled. But there is no reason why larger areas cannot be foiled, though large solid areas of foil tend to be a rarity, for design reasons. What designs work best with foiling? Can foiling be used for intricate designs? Simple solid shapes that avoid fine details work the best; text that does not use fine serifs and that is not in a small point size. Also, as foiling is a different process to printing, registering the foil to the print can cause issues so we would recommend a design that take this into account and doesn’t require exactingly accurate registration. Can I use a variety of foils on print? Yes, it is quite common to use a couple of foil colours on the same job, just as you would use different colours on a printed job. Can foiling be used to add security features to products such as tickets or gift vouchers? Standard holographic wallpaper pattern foils are a good way to add a level of security to tickets and vouchers; they offer an average deterrent against forgery. A better way to secure your item is to have a custom holographic foil manufactured, which will be difficult to copy. How does the foil blocking process work? A metal engraved block is used under pressure and heat to push an adhesive backed foil onto a sheet. The foil adheres to the sheet. Embossing or debossing is the process of deforming a flat sheet of paper to lift or indent it into a desired shape. What is the difference between embossing, blind embossing and debossing? Embossing is where the readable image is pressed upwards creating a raised readable image. Debossing is where the readable image is presses down creating an indented readable image. Blind embossing is where the embossed sheet is adhered to a 2nd sheet and the reverse indented side of the sheet is then hidden from sight. How does the embossing process work? A male and female tool are made from metal, engraved to the desired detail required. The substrate to be embossed is placed between the two tools and placed under pressure. The flat substrate then takes on the detail of the two embossing blocks. 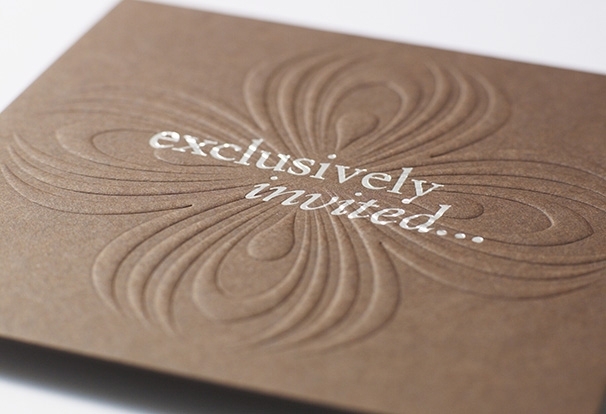 Do you provide an embossing service for wedding invitations? We do and it’s a great way to create something special for your invite, though it does add an extra cost so isn’t for everybody. If you want to spend a little more on your invites to create something really unique then we are more than happy to print your item. We’ve done plenty of wedding invitations in the past that involve both embossing and foiling. Can foiling and embossing be done on envelopes? Yes, as long as the design is right. The more precise approach is to foil or emboss a flat sheet and make the envelope up afterwards. Can embossing and foiling techniques be combined in the same design? Certainly, we can mix foiling and embossing on the same job separately or even foil and emboss the same detail at the same time. The end effect is raised area that catches the light, bringing out the best of both these finishing techniques. We are always happy to advise so please give us a call and talk to us.